Purple claims their mattresses are better because of scientific evidence. We'll start our comparison by looking at the mattresses from each brand. We picked the AS2 to represent Amerisleep. It’s our most affordable bed with targeted support and pressure relief. Research shows 81% of mattress buyers want this type of support. We picked the Original Purple Mattress because we feel it shows the best value Purple offers. We think the New Purple Mattress may actually cost more money for worse performance. The thicker mattress is the AS2, which stands 12" tall. The Original Purple Mattress has a 9.5" mattress depth. The AS2 incorporates a fabric determined by FDA to promote better sleep1. The Purple just uses viscose, polyester, and lycra. Since the AS2 costs $100 more than the Original Purple, Purple has the edge in the price category. The AS2 also uses materials proven in peer-reviewed trials - while the Original Purple Mattress does not2. While both mattresses offer pressure relief, the AS2 is the only one to provide targeted cushion and support for sensitive areas with our HIVE® technology. The Original Purple Mattress doesn't offer designated support zones, while the AS2 provides five to cover the head, shoulders, lower back, hips, and feet. Both mattresses feature a comfortable and cooling support layer, which wicks away heat. The AS2 receives a positive score in six out of seven categories (86%). The Original Purple only gets a two out of seven (29%). Now, let us focus on the brands behind the products to compare Purple and Amerisleep as companies. Both Amerisleep and Purple get positive marks for offering a 100-night trial. Beyond that though, Amerisleep beats Purple in the five other categories. 99% of Amerisleep customers rate us three or more stars5. Only 93% of Purple customers rate them three or more stars6. Amerisleep has five models, ranging from firm to soft. Purple only has four. That means Amerisleep gives customers more ways to find the perfect bed. Amerisleep protects its customers for twice as long by offering 20 years of coverage. Customers are eligible for a full mattress replacement within the first decade. Over the second decade, the warranty provides prorated coverage. Purple only offers 10 years of full coverage. The warranty covers any sagging deeper than 0.75 inches. Purple's warranty doesn't cover you until sagging reaches a full inch. Mattresses that sag over time can force your body out of alignment. And sagging can cause painful pressure points. Amerisleep has been in business for 12 years, beginning in 2006. The team behind Purple invented their patented machine in 2013. But Purple the company did not start until 2015 - just 3 years ago. Amerisleep receives a positive score in all six categories (100%). But during our research, we did not find a single reference to a peer-reviewed study about Purple. Nor did we find any certifications from government agencies. 1 A third-party, peer-reviewed study showed our HIVE® layer reduces pressure points 49%2. 2 The FDA determined our mattress cover promotes increased comfort and more restful sleep. It uses a fabric called Celliant®, which qualifies as a medical device under section 201(h) of the Federal Food, Drug and Cosmetic Act1. So which mattress do you think is really "backed by science"? Both Amerisleep and Purple receive positive marks for having a CertiPUR-US® certification. However, Amerisleep outperforms Purple in the two remaining categories. Amerisleep uses foam made partially from plant-based materials. That's more sustainable than other mattresses, which use 100% petroleum (crude oil). Purple does not mention using materials made partially from plants. Amerisleep also manufactures its foam with a process called Variable Pressure Foaming (VPF). With this patented technique, the foam comes together in a closed chamber. Any emissions get trapped in carbon filters, so it produces virtually zero pollution8. Amerisleep earns a positive score in a perfect three out of three categories (100%). Purple only hits one out of three (33%). But is it worth saving $100 to sleep on a mattress — every night — that is 69 percentage points worse, based on our comparison? Order your Amerisleep AS2 today for the best sleep ever. Backed by our 100-night trial with free returns. 3 Purple posts videos from a number of their own tests on their website: https://purple.com/mattresses/science. But during our research, we could not find references for any third-party, peer-reviewed studies. We also did not find any certifications from government agencies. 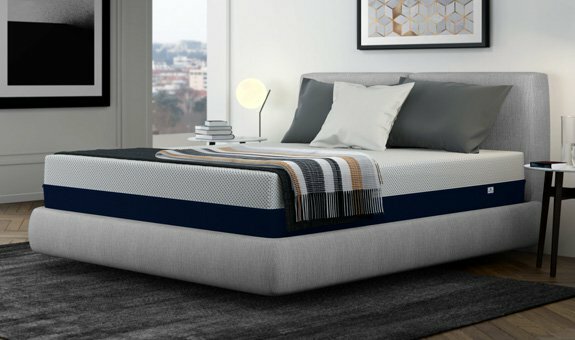 5 Based on reviews on all five mattress product pages at https://amerisleep.com as of 12 June, 2018 and verified by PowerReviews. 6 Based on reviews at https://purple.com/mattresses/reviews as of 12 June, 2018. 7 Hogan, S. O., Edinger, J. D., Bieler, G. S., and Krystal, A., D. (2011). Choosing the best mattress: An experiment in testing whether individuals choose a bed that leads to improved sleep (RTI Press publication No. RR-0016-1108). Research Triangle Park, NC: RTI Press. 8 According to our foam manufacturer "The pouring of foam in an enclosed chamber allows virtually all of the process emissions to be collected into carbon beds. Compared to standard foam production methods, VPFTM technology exceeds the Clean Air Act requirements."